PROPERTY DESCRIPTION: 58 acres of heavy timber with 2 Quarry Pit Ponds, Spring Creek, high rocky bluffs, and heavy timber with 1/2 Mile of Arkansas River frontage. Great opportunity to have a sportsman’s paradise! Enjoy high quality hunting and fishing with excellent access along blacktop HWY 166. Enter the gate and it becomes like a new world with excellent privacy and seclusion. You could spend weeks exploring and not see even a fraction of the property! LEGAL DESCRIPTION: 58 taxable acres located in Section 35, Township 34 South, Range 03 East of the 6th PM, Cowley County, Kansas. Long exact legal available upon request. LAND LOCATION: From Downtown Arkansas City, West on Madison Ave (HWY 166). Property is located immediately across the Arkansas River on the South side of the Highway. 2017 REAL ESTATE TAXES: $1794.40. 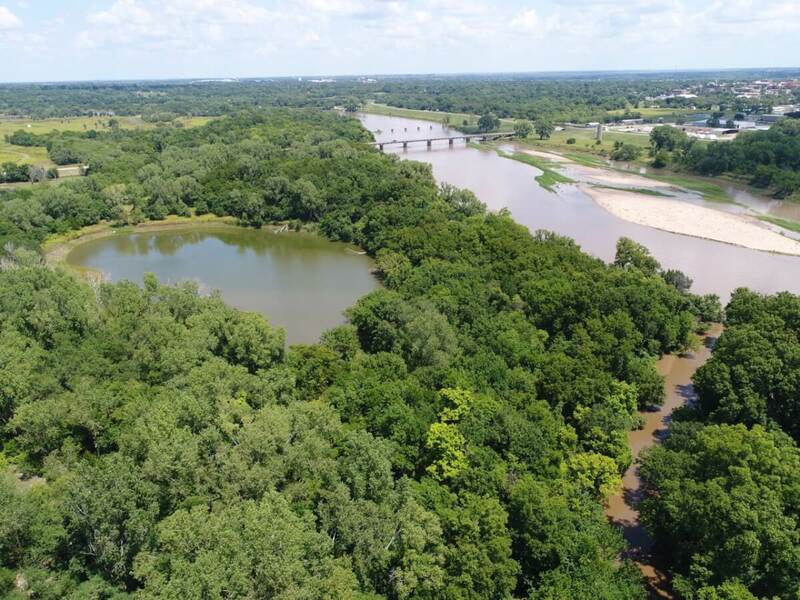 PROPERTY DESCRIPTION: 29.1 acres of heavy timber, a large old Silo, a Quarry Pit Pond, and 1/2 mile of Arkansas River frontage. This property has been leased for recreation use and has good jeep and 4-wheeler trails throughout. Great opportunity to continue that use, set up a paint ball course, or use for hunting & fishing! LEGAL DESCRIPTION: 29.1 taxable acres located in Section 26, Township 34 South, Range 03 East of the 6th PM, Cowley County, Kansas. Long exact legal available upon request. LAND LOCATION: Access is 1 Mile West of Arkansas City on HWY 166 to 41st St, North 1/2 Mile to 286th Rd, 1 Mile East to the property. 2017 REAL ESTATE TAXES: $924.66. PROPERTY DESCRIPTION: 4.5 acres located bordering Veterans Lake on 6th Street in southwest Arkansas City, Kansas with pasture, timber, and a pond! Currently zoned Vacant Lots according to Cowley County, with residential noted as the highest and best use. Great opportunity to own land for a potential home building site or location to camp, fish, and relax! LEGAL DESCRIPTION: All of Block A and Lots 1 and 2 and Lots 27 and 28 of Block B in Riverside Addition to the City of Arkansas City, Cowley County, Kansas, subject to railroad right of way. LAND LOCATION: From Summit St at the Cowley College Athletic Facility, West on Pierce to 6th St.
2017 REAL ESTATE TAXES: $234.22.